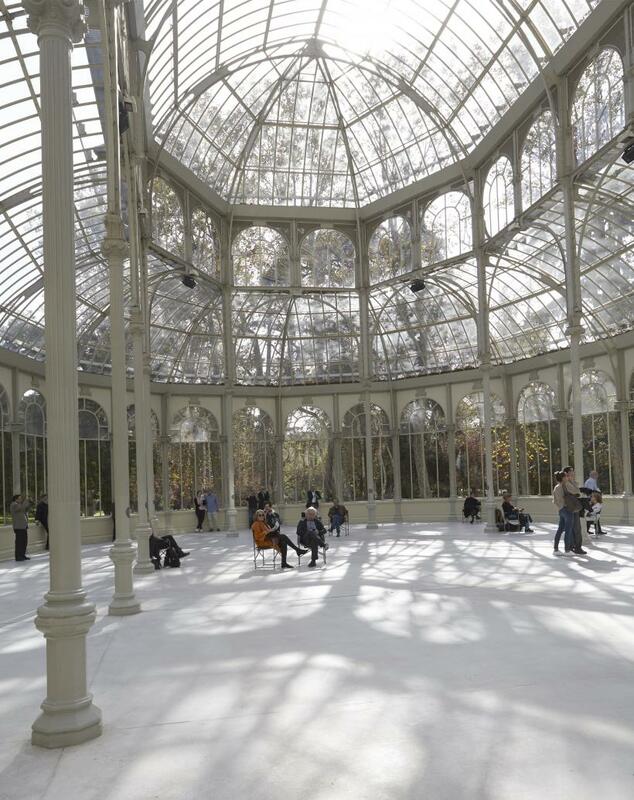 Title : Lothar Baumgarten, The ship is going under, the ice is breaking through, Palacio de Cristal, Museo Nacional Centro de Arte Reina Sofía, 2016. 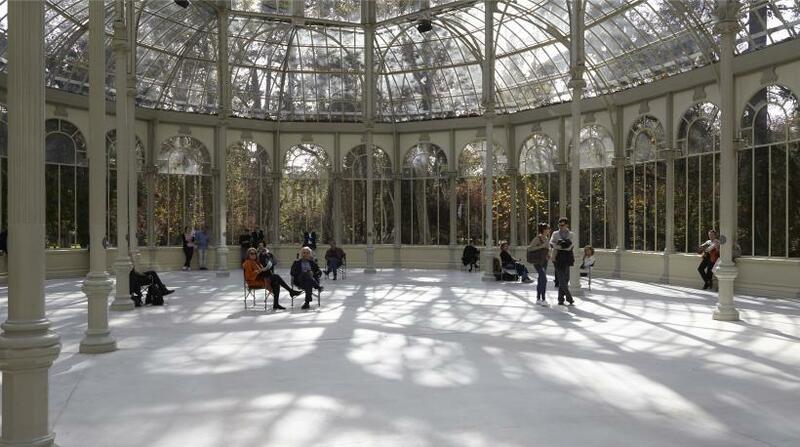 The Palacio de Cristal is an ornate iron-framed glass house located in Madrid’s Buen Retiro Park. Built in 1887, the same year as Queen Victoria’s Golden Jubilee, to exhibit botanical and animal specimens from Spain’s former (and final) colony of the Philippines, the site is embedded with a suite of political and historical narratives redolent of grandeur, wealth, power and control. 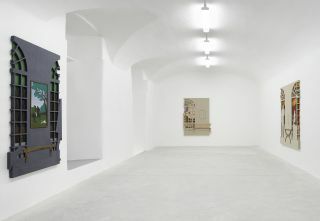 Now re-purposed as an exhibition venue, the Palacio presently plays host to a work whose soundscape is vaguely reminiscent of something breaking. At first, the ‘something’ is not quite identifiable – a metaphor for our times if ever there was one. 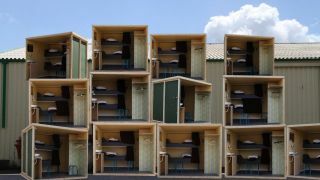 The soundscape is a site-responsive work by German artist Lothar Baumgarten titled, ‘The ship is going under, the ice is breaking through’, an unfolding multi-channel audio piece that completely fills the glass house with sounds that reverberate around its interior. 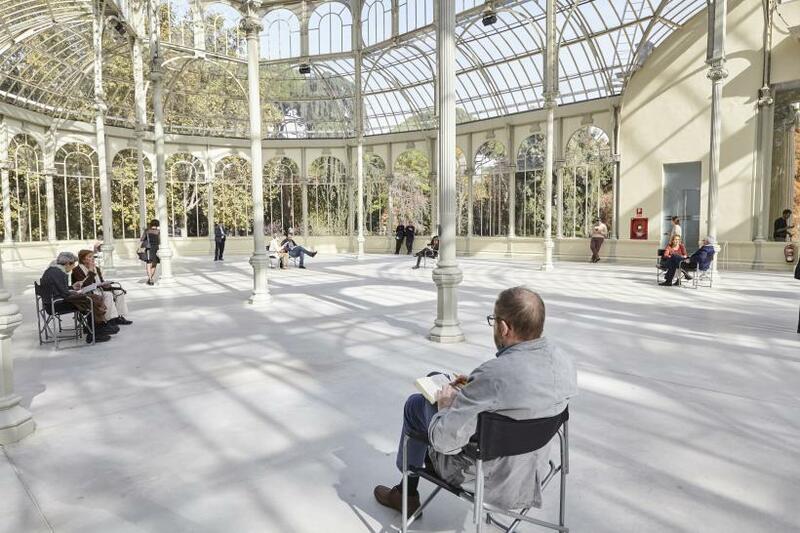 Empty of any object but visitors’ chairs, the iron-work structure is palpably altered by sound, re-animated and re-purposed by the artist’s work as a political meditation. 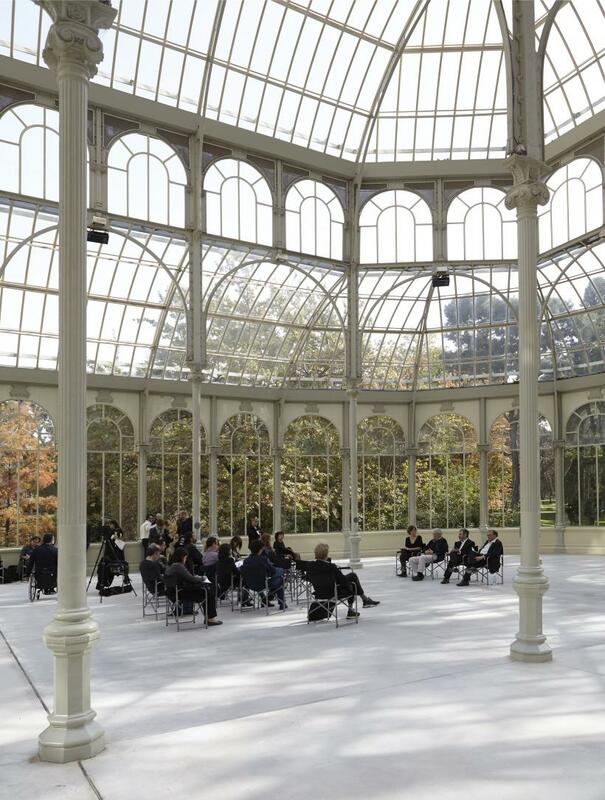 Baumgarten’s soundscape is described by the Museo Nacional Centro de Arte Reina Sofía, the commissioners of the two-hour long piece, as reflecting the cracking of glass – something that would be truly disturbing here – but in truth the sounds are glitchier and squeakier. There are scrunching kinds of noises; sometimes there are ticks or pings and at other times multiple layers erupt into crashes. There is no discernible rhythm to the sounds that seem to ricochet from the glass. This is because they are amplified recordings of melting ice – not the polar caps, however, nor anywhere in Spain, but ice on the banks of New York’s River Hudson. 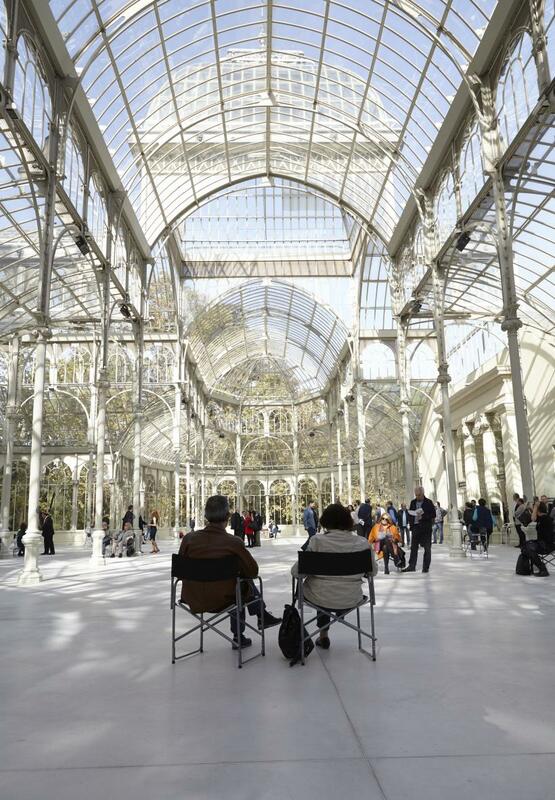 This melting ice is at odds with the sun that floods the Palacio with light, offering hundreds of glass-framed views of the grand parkland outside, yet there is a logic here too. Something is breaking, melting, disappearing in plain sight, though it goes unnoticed. Effects of actions that cannot be seen can be felt and heard elsewhere, even while we might pretend otherwise. The title of the work speaks explicitly of disaster, one that has many keen resonances – past and present, real-life and literary, economic, ecological, social, philosophical and physical disasters – all are all bound up in this. That America plays a part too, is surely no coincidence, especially as Baumgarten divides his time between Berlin and New York. Baumgarten’s works have long been concerned with ethnography, anthropology and the corruptions of colonialism. ‘The ship is going under, the ice is breaking through’ continues a body of research on nature begun during the 1960s. 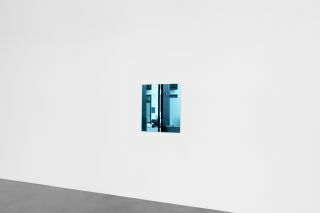 This strange and deceptively simple work offers a critical depiction of the site in which it is housed, under the umbrella of the Reina Sofia and within the context of the world at large. While the conflation of Spanish Colonial history and the site-specificities of the Hudson sit a little awkwardly, this geographic expansion prevents the work both from merely illustrating a problem while encompassing and implicating all of us in it.